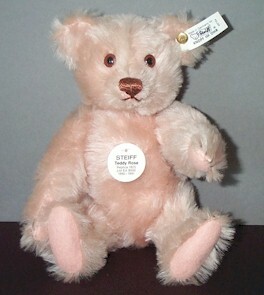 This bear has been made in 1991 and is an exact replica of the bear issued by Steiff in 1926. He is 40 cm. / 16" tall and limited to 6.000 pieces. This clown is made in 1986 and he is is an exact replica of the clown Steiff produced in 1926. He is 32 cm. / 12.8" tall and limited to 10.000 pieces. This bear has been made in 1983 for the occasion of the 80th anniversary of the Teddy Bear that has been invented by Richard Steiff.. This wonderful piece is made in 1988. The bears are 11 cm. / 4.5 inches each. It is a limited edition of 4.000 pieces. When you pull the wig wag along the bears go up and down. This bear is made in 1990 as a limited edition of 6.000 pieces. He has two bigger brothers that are only made for the USA. They are 46 cm./ 18" and 60 cm./ 24". 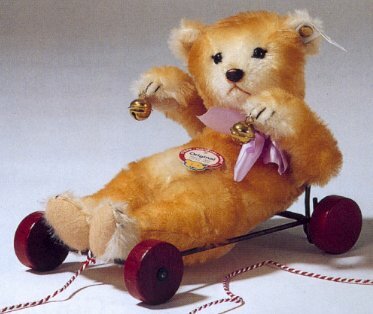 This bear has been made by Steiff in 1990 in a limited edition of 8.000 pieces. He is stuffed with excelsior and even his squeaker is still working. This is a replica of a bear issued in 1939. He is 20 cm. / 8 inches tall and his arms move when you pull him along. It is a limited edition of 4.000 pieces world wide and re-issued in 1989.